A lot can happen in one hundred years. Think of how our country has been transformed through the hundred years from 1909 to 2009 from the horse and buggy to the nuclear age. In this study we look at another transformation. What has happened with the Lutheran churches that were in India in 1909 up to the present? Lutherans first came to India in mission in 1706 with Ziegenbalg and Pluetschau. The nineteenth century though was the century of great missionary endeavor all over the world. It was no less in India. We view those Lutheran missions that were in operation as the twentieth century began and then one hundred years later. The Lutherans are investigated since we are Lutherans and know the great gifts God gave back to His church through the Lutheran Reformation: justification by faith, universal justification, baptism, communion… This study is just a sketch to remind us of what God is doing and also sadly how man so often can mess things up. In connection with ‘messing up’ as we go through this study we see the results of the nineteenth century mission work was carried on from Europe by mission societies mainly. Since the state churches for so long neglected outreach beyond their borders, God raised up mission societies to do what He wanted done. · Gossner(Berlin II) Society – 1836, which worked in India. In 1909 these four were also the largest in terms of yearly income. These four were among the five societies with the highest number of baptized members. With the exception of Gossner, they had the largest number of ordained missionaries in the field. So we see that India was seen by two of the four as a definite field in which to labor. Of the societies that were the most ‘Lutheran’ Prof. Peters(WELS) cites: Bleckmar(Hanover Free Church), Hermannsburg and Leipzig. Pastor Lenker(General Synod) cites in his words as “strictly confessional”: Leipzig, Neuendettelsau, Bleckmar, and Hermannsburg. So two of the more Lutheran societies, Hermannsburg and Leipzig, labored in India. Leipzig Missionary Society (1836) was called the ‘Aristocrat among Missions’ and sought to unite Lutherans of Europe and America in the great missionary enterprise. For seventeen years they operated out of Dresden as a branch of the Basel Society. Then trying to be more Lutheran they struck out on their own. In the USA the LC-MS mission festival offerings were sent to Leipzig until 1876 when Missionaries Zorn and Zucker in India withdrew from the Leipzig Society over doctrinal issues and joined the LC-MS.
withdrew from Leipzig and joined LC-MS. The LC-MS work turned into the India Evangelical Lutheran Church(IELC). It started in the far south around Nagercoil and moved north toward Madras. Leipzig continued to work in the south among the Tamils. They basically carried on the work begun by Ziegenbalg and Pluetschau and worked with other societies also. Today the Tamil Evangelical Lutheran Church(TELC) traces their history back through Leipzig to Ziegenbalg. While they may have been unionistic, they sure did put out. Their work was in the south. · Calcutta among the Kols – date unknown. Even today this Lutheran work goes by the name Gossner Evangelical Lutheran Church. The Hermannsburg Society is a thrilling story from beginning to end. It was founded in 1849 by Pastor Louis Harms. Under his ministry in the village Hermannsburg the whole congregation became a mission society, not merely a few members. The congregation was also known as the “Farmers Missionary Society.” Hermannsburg began working among the Telugus in 1866. Today the South Andhra Evangelical Lutheran Church owes its existence to the Hermannsburg work. So far then these were the four largest European societies working in India. There were smaller Lutheran mission societies also at work in India. Schleswig-Holstein Evangelical Lutheran Missionary Society, also known as Breklum, where it was headquartered began work in the Rajahmundry area of Andhra Pradesh in 1845, which was transferred to Americans five years later. But still with work started in 1877 Breklum was working elsewhere among the Telugus. The modern Jeypore Evangelical Lutheran Church traces its beginning to the work of Breklum. The Danish Missionary Society began work among the Tamils in 1860. Their work spread to Madras, Bangalore and South Arcot. Today the Arcot Lutheran Church traces its beginnings to this Danish work. World Mission Prayer League voted in 1891 to form the American Board of the Norwegian Santal Mission. In 1904 they sent missionaries to work in that field. From Sweden the Fatherland Society evidently also known as the Swedish Evangelical National Missionary Society began work among the Ghonds in the Central Provinces in 1877. Today the Lutheran church from that work is called the Evangelical Lutheran Church in Madhya Pradesh or the Madhya Pradesh Evangelical Lutheran Kalisiya. The Swedish Church Mission also joined in with Leipzig in 1849 working among the Tamils and in 1876 assumed a share of the Tamil field. The smallest of the societies was the Loventhal which began work in south India in 1872. This appears to have been Grundtvigian. While the LC-MS work which began with the commissioning of two former Leipzig men on October 14, 1894, the General Council and General Synod Lutherans were at work fifty years before. The first American Lutheran missionary to India was John Frederick Heyer who was supported by the Pennsylvania Ministerium and later by the General Synod. The year was 1842. The two fields of Guntur and Rajahmundry developed into the largest Lutheran church in India, the Andhra Evangelical Lutheran Church. So as we take in the overview of where Lutheran mission societies were working by 1909 the work stretched from one end of the East Coast of India to the other, from Cape Coromandel to Bengal. One exception of more inland effort was work in Madya Pradesh in the central north. The one society that worked along the Malabar (west) coast was Basel. Among all the Lutherans there were in 1909 172 missionaries working. Of these 156 were ordained pastors with 16 other men helping. The 122 wives of these men carried responsibilities for the work also. And there were 65 single women helping. Of the Indian workers at that time there were: 1123 Gospel workers, 1906 school teachers, 155 Bible women. Missions viewed setting up schools as a viable way of reaching out. The Bible women were especially important in reaching out to Hindu and Muslim women who could not be approached by men. In 1909 there were 1704 baptisms carried out. The number of inquirers was 25,671 which must be those going through some sort of instruction. Total communicants was 67,534. Total souls in the churches was 186,175. In 2006 there were 1,860,888 members in the Lutheran churches, which would be a tenfold increase in 100 years. (Or from another source there are 2.5 million Lutherans in India.) The total population for British India for the last census report (1901) before 1909 was 294,361,056. This included also: present day Pakistan, Bangladesh, Burma and what was then the princely states. 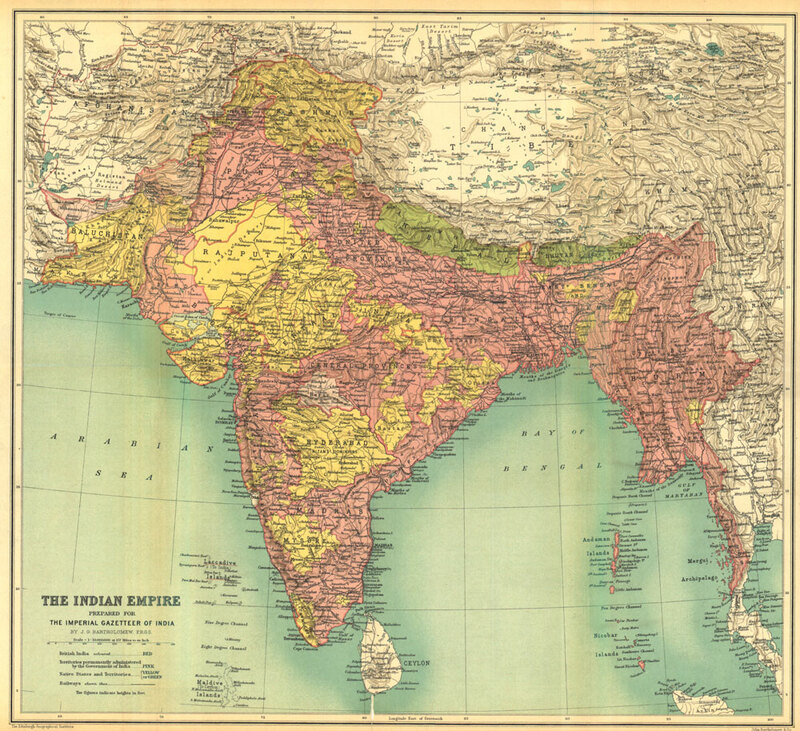 You can see British India on the map. All things considered it appears that the growth among Lutheran churches was greater than the rate of population growth, for which we thank the Lord. Today in India all Christians cannot make up more than 4-5% of the population, which indicates a lot of work still to do. And we remember sadly how so many Lutherans have vitiated their message with so much error and compromise. As we look at the Lutheran churches today we proceed from the southern tip of India north along the East coast. But before we saunter up the east coast along Coromandel north, let’s glance up the west coast for a bit along Malabar. The Basel Society was a hybrid from the beginning being a joint effort of the Reformed Church of Basel and the Lutheran Church of Wuerttemberg. There was no question that they were concerned about salvation for the heathen. They did not give in under rationalistic pressure. And from their four fields it is evident they were busy. They decided to go to areas where there had not been any Protestant work, hence up the Malabar coast. They eyed for their work all the way from Calicut to Bombay some 500 miles. They were strong on Christian education for the converts and set up schools. Before long the missionaries felt that they had to involve themselves in creating some remunerative jobs rather than just educating people. They saw that when an individual converted he was often cast out from family and support. So they sought to start work that people could do. This was commendable. But I think it became so dominant that it moved the mission away from what was number one – Gospel preaching. Even today in India the Basel Mission is best known for the industries connected with it. It was good that they set up cottage industries and tried to have the people learn business on Christian principles. You will not find any Lutheran churches from the Basel mission, or at least I have not. Basel was ecumenical from its beginning. In India it worked in early years with an Anglican society(CMS) and then became part of the unionistic Church of South India. So much for the Malabar coast. Now off to the Coromandel coast. This LC-MS mission worked in Tamil Nadu state moving north from Trivandrum to Krishnagiri, Ambur, Vaniyambadi. They also went west into Malayalam speaking areas into Kerala state. There are some noteworthy names in their work. H. Nau worked here in India, who was later to make the exploratory trip to Nigeria in the ‘30’s and was instrumental in forming a group interested in Muslim missions headquartered in North Carolina. George Naumann working in India in 1900. They maintain their seminary at Nagercoil. While most Lutheran churches are unionistic in their seminary training, the IELC keeps its school going. They belong to the LC-MS worldwide communion of the International Lutheran Council. And in line with Missouri’s ‘levels of fellowship’ teaching at the same time they belong to the unionistic Lutheran World Federation and the United Evangelical Lutheran Church in India, which is made up of eleven Lutheran church bodies. With 400 congregations and 160 trained pastors they have grown substantially since 1895. They also began work in Sri Lanka. While they have had internal problems, a former president of theirs, Isaac Moon, was rather outreach minded and instrumental in helping to start the Upper Myanmar Evangelical Lutheran Church that we now have visited and likely will have fellowship with located in Chin State, Burma. A lot of information can be found out about the Danish work through the years in “It Began in Copenhagen”(Junctions in 300 years of Indian-Danish Relations in Christian Mission) by Oommen and Iversen. We give God the praise that He used such a small country to: begin Protestant/Lutheran mission work in India in 1706, begin again Danish work in 1863 in Arcot, to have involvement with the Loventhal mission in Vellore, to do even more work through Danes in Jeypore and in the Danish Santal mission. Sort of makes you realize that no matter how small the group, God does the work through them. And God crowns the work with blessing. They are a member of UELCI. In 1909 baptized members – 100…In 2009 ? In 1909 there were two stations served by two ordained missionaries and one European lay worker. In 1909 Anne Marie Petersen(1878-1951) came to work in the mission and you can read about her interesting life. The founder of the mission was Edvard Loventhal, who was Grundtvigian in his understanding of Christianity. The work began in 1872. Perhaps it was later absorbed by the Danes. While they support a their own seminary in Tranquebar, they are members of the LWF and the UELCI. We certainly thank God that they came back to their Lutheran roots through Leipzig. But the liberalism that caused so many men to leave Leipzig was then sown and today the result is their of union in Lutheran organizations. Now we cross the present border between Tamil Nadu and Andhra Pradesh. Andhra Pradesh has the largest Lutheran church in India, the AELC. The state also has to have the largest number of different Lutheran church bodies, fourteen and still counting. Pastor Mohan Bas started his church in l981 in Kanyikumari at the southern tip of India. He had left the IELC. The church was then the Bharath Ev. Luth. Church. Now separate from Bas it has 14,191 souls, 338 pastors and 16 in its two year training program. It works also in AP and in the Nicobar and Andaman Islands. They are praying about work in Bangalore and Jharkhand State. Another former Leipzig missionary, in this case Mylius, came to the Nellore field and opened stations at Gudur and Nyadupet. Today this church cooperates with the AELC in supporting the seminary at Rajahmundry. Their old hymnal reflects through the tunes many old German Lutheran hymns. Their headquarters is at Tirupatti, in Chittoor District. They belong to the LWF and the UELCI. While the AELC claims that the Rajahmundry field was started in 1845 by Pastor Luis P. Manno Valett of the North German Missionary Society(Bremen) I don’t have information from that society for 1909 in India. They listed their work as in Togo. The Malabar Mission Society states that in 1845 the Breklum Mission had started work in Rajahmundry and then transferred it to the General synod in 1850. Both fields were at first under the General Synod, with the Rajahmundry field being taken over by the General Council. The Augustana Synod also helped there. Today the AELC is in both the LWF and the UELCI. It has had internal problems in recent years, even having two Presidents, or at least two men claiming to be president. A synod as large as this with over 500 pastors and 5000 congregations is bound to face difficulties. They have opted for ordination of women among other things. Both the WELS and the ELS work in the area of the AELC as do we. AELC’s seminary is at Rajahmundry while their Christian College is in Guntur. Evidently, spawned from this large Lutheran church are a lot of other Lutheran church bodies in Andhra Pradesh. Of course our V.S. Benjamin came from the AELC. Membership 9000 souls, Pastors – 108 It was started in 1968 by V. S. Benjamin. Its work in Andhra Pradesh stretches from Kakinada to Ongole and up to Hyderabad. In addition it has a cluster of congregations in Chattisgarh State. Thirty-eight are in the three year seminary. This is located in Seetharama Nagar, Guntur. They have a website and indicate they are interested in reforming Lutheranism, getting back to what are true Lutheran teachings. They had a seminar in ’06 which had participants from several Lutheran church bodies. They evidently want participation from any and all Lutherans interested in getting back to Lutheran teaching. They indicate they would like to set up Lutheran Study Centers throughout AP. This is the independent church group that supports the Lutheran Study Center. They are in fellowship with the Ev. Luth. Conf. and Ministerium. In India they had nine congregations with six additional evangelists. They started in ’98 due to the liberalism in the AELC. Rev. P. B. Ravi Prasad is the head of the group of independent Lutheran congregations. This body is also in fellowship with the Ev. Luth. Conf. and Ministerium. There are seven parishes with two ordained and five unordained pastors. They are in Hyderabad and Ranga Reddy District. They are in Hyderabad and in fellowship with the Ev. Luth. Conference and Ministerium(Pastor Steward in Pennsylvania). The VP in India is Pastor K. Prem Kumar. This is headed by Pastor Prakasm. It has 61 pastors and 122 congregations. It is also in fellowship with the Ev. Luth. Conf. and Ministerium. So up to this point in time it appears that Pastor Steward’s synod, the ELCM, is in fellowship with the LFI, LCC, ELCC, CSCM. It has headquarters at Cherala. There are 40-50 pastors. It is led by Pres. Rev. Dasari Luther Shastri( a nephew of Dasari Bushanarao). This was Dasari Bushanarao’s group. Its president is Rev. G. Shalem Raju. Dasari Bushanarao joined the WELS and even went to the seminary for a time returning to India and being part of WELS’ three man team until the Lord called him home. After that there was dissension and separation. The Christ Evangelical Lutheran Mission is associated with the WELS. It is centered in Guntur and at the end of ’08 included more than 7000 souls in about 125 congregations. At that same time those enrolled in the Guntur seminary included 40 in the pre-seminary and 39 in the seminary. This group withdrew from the WELS mission and is supported by the ELS. They claim to have 25,000 members. They support 200 orphans, and 22 men in seminary training with two going to the ELS Bethany Seminary in the USA. In India they are centered at: Hyderabad, Rajahmundry, Jabalpur. I have only found their name so far. They have 41,786 souls in 41 pastorates in East and West Godhavari, Warangal Districts of AP and stretch over into Madya Pradesh in Baster District. It started in 1972 under Rev. Dr. Paul Raj, a convert from a a Hindu family. They are translating the Bible into Joya. It has 9837 members and is headquartered at Bhadrachalem, AP. The next state up the coast from Andhra Pradesh is Orissa. The Schleswig-Holstein Evangelical Lutheran Missionary Society at Breklum had started work in Rajahmundry and then transferred this to Americans. Next they worked in Koraput District of Orissa among Telugu speakers. They started more stations at Salur and Koraput. Before long they were translating material into the Oriya language. What is called a mass movement developed among the Dambas. Eventually American Lutherans took over the support. Today they have a seminary at Kotapad which trains lay leaders and pastors. Member of UELCI. This is a smaller Lutheran church body. It was originally part of Breklum and then under the Danish Missionary Society. It has three main centers and seems to work with Jeypore ELC. It traces its roots to Breklum. As time passed pure Lutheran teachings were increasingly abandoned. Pentecostal/charismatic influence came. Struggles over power and money developed. This scenario is repeated many times over among the church bodies. In 1995 Rev. Pramod Kumar Nag founded this church body. They had 23 confessional Lutheran congregations with pastors and catechists. They entered fellowship with the Evangelical Lutheran Conference and Ministerium in 2004. (This makes 5 with ELCM.) Rev. Nag joined a holiness church body and took a large number with him. Now the church is under the leadership of Hansudaya Asher of the Kotpad District. They also work in the Nabarangpur District. We cross the border to Jharkand state. Four Gossner missionaries arrived in Calcutta in 1844 and came into contact with Kols. They went to this people’s native area at Chota Nagpur. The headquarters was established at Ranchi and still is. A mass movement began among the Kols. The mission also followed Kols who migrated to Assam for work and missionwork was begun there. Before long Gossner was working among ten language groups. Indian Gossner leaders have remained Lutheran though there have been temptations to defect. The church is a member of LWF and UELCI. This church body has 110,301 members in 650 congregations with 75 pastors. Though it is supported by ELCA from USA it is not in fellowship with LWF or UELCI. This was the one Lutheran effort on the Coromandel coast that went inland. The Swedish Evangelical National Missionary Society began work among the tribal Ghonds in 1877. Later the work moved on among caste Hindus. There are now 52 pastorates. It has recently extended its work to Anappur Bhandara and Tumsar in Maharashtra. Headquarters is at Chhindwara, Madya Pradesh. You can see from the numbers that mission work in this area is difficult. But praise God that the Swedes went inland. We go back along the coast to Bengal and up to Assam. This was the Santal Mission of the Northern Churches. It was Norwegian, Swedish and Danish supported. Later also support came from Scandinavians in the USA. Work was done in the Santali, Boroni, Bengali and Hindi tongues. As the Santal people moved from Bengal to Bihar and Assam they were followed in the outreach efforts. Missionaries also went to Nepal and Bhutan. Headquarters is at Ebenezer since 1891. Member of UELCI. This church body was started in 2003 and joined the UELCI. It has about 30,000 members. It combines five distinct ethnic communities, Bodos, Assamese, Oriyas in the Himalayan States, Zomis of North East India, Manipuris into four dioceses. Bodo Ev. Diocese, Assam Ev. Lutheran Church, Eastern Ev. Luth. Church and the Ev. Lutheran Christian Church, Manipur joined together. The executive secretary, Pastor N. Kaizanang, of one of these constituent bodies, the Eastern Ev. Luth. Ch. at Manipur was one of the two contact persons who with I. Moon of the IELC helped inaugurate what became the UMELC with which we now are beginning to work. There were specific reasons why Ziegenbalg and Pluetschau went to the Danish colony to begin their work in 1706. Of course they were supported by the Danish King in his overseas lands. But the English would not allow them, since they favored the Church of England. Even Danish colonial powers in Tranquebar opposed the Lutheran missionaries. The devil has not changed. Today he simply is using the same tools. In Orissa State there is violent persecution. In several states there are anti-conversion laws. And yet our Lord has promised that the gates of hell shall not prevail against His kingdom.